Your home is a place you love because it is not merely a place you call your own but it is also a place where people close to your hearts are dwelling. This is the reason why most people see to it that their homes are well taken care of. Having a clean and organized home is a manifestation of love and care to those residing in it. Part of that is by decorating your home to make it pleasing to live in. When decorating, it would include all parts of the house from ceiling to flooring, from living room to bathroom. For today’s tip, we will give you the different creative manners on how you can give life to your home’s walls. Some homeowners prefer to just paint it plain but there are others who add some other decorations and designs in order to make their home more attractive. The wall can be found all around the house and it would always be noticed by everyone. So, giving it a unique touch can give your home a more personal look. Read on the tips below so you can attain more lively walls. There are companies that sell wall stickers of different designs. 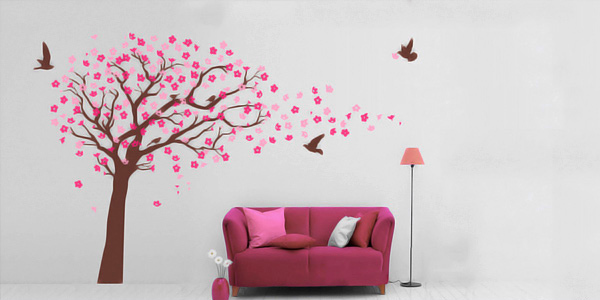 Wall stickers can add beauty to your walls and can also be a great advantage for you because you can reuse these stickers. 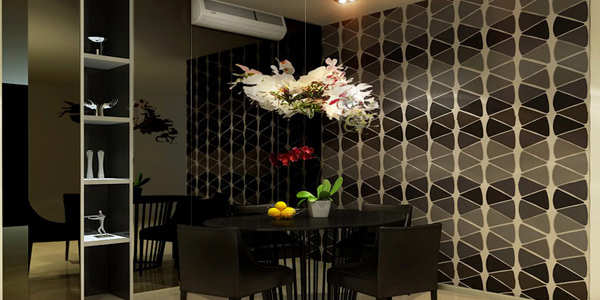 Like any other stickers, wall sticker decors can be removed and transferred into other areas of the house. It can surely add beauty to your walls. 3. Try having faux painting. Murals can come in different mediums, too. But it would be more original if your mural is hand painted. It will give a more impressive impact especially if the mural painting is well done with intricate details. Also, see to it that the mural you have is appropriate for your home’s area. It would be okay to choose whatever you want especially for the bedroom but when you are on the public areas, it has to be apt. Shelves are not just there for storage or displays. It can also be a good element of design for your wall. There are different shelf designs that you can choose from. You can also use lively or warm colors for your shelf. After you are done with it, you will surely be amazed on how your shelf can bring life to your plain wall. It can even be more enhanced if you place great stuffs on it. 6. Play with tiles or bricks. You can also make use of tiles or brick for your wall. It can also look good especially if the tiling is done creatively. Some make use of different colors of tiles and arrange them in a creative manner on the wall. Others merely place the same colors and styles of tiles and bricks. In whatever way you do, it would certainly look good. 7. Place lots of frames. Framing a picture or a painting and placing it on your wall can already look good. But if you use lots of frames, it will look even more attractive. You can do that on your own or you can buy frames that are sold by set. Some comes in different sizes while others are of the same sizes but different framed designs. There are even frames that look like a hug jigsaw puzzle for even if they come in different frames, they comprise one image only. Mirrors can also look good on the wall. These are mirrors that have unique shapes and have decorative edgings. When used in your living room, bedroom and bathroom, these mirrors can bring your walls to a different level. It can even help you to have a larger space visually because light bounces on it. 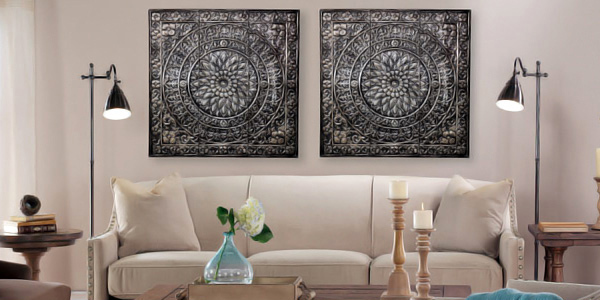 Another great way of enhancing your walls is by placing wall sculptures on it. This comes in various designs. Commonly, one would see carved masks, fans, abstract designs, labyrinths and others. Although, these are much expensive, they surely look great on your walls. 10. Paint with lovely colors. If you do not want to decorate your wall much, you can just paint it. Choose colors that will be appropriate for your room. If your room is small, it would be better to use white, beige or cream to make it look larger. Or you can also use bright colors to still get a larger look. But if your room is large, you can have more intricate decors and use warm colors for the paint. There are so many ways to liven up your wall. Aside from those mentioned, you can also try placing some used CDs on your bedroom wall and some unframed art works on a canvass. Yu can also be creative so you can look for other ways to decorate your wall. You might also want to accessorize your entire living room instead of just the walls. You can also look into other decorating tips for your bedroom, dining room and bathroom.